The church needs good art. I’ll never forget the first time I visited a friend’s church and saw the “sermon series” model working really well. They had a floor-to-ceiling art display in the lobby. The greeters were handing out matching welcome cards. As the lead pastor walked onto stage, I saw the series graphics again. Before he ever spoke a word, I felt oriented and excited. This might sound like “business as usual” for you, but this was my first time seeing anything like that. I was blown away. Not only was it easier to follow along, but I retained what the pastor said the next week. We need art, and it needs to be good. As many screen and social graphics as you need. Working files for your team to use. 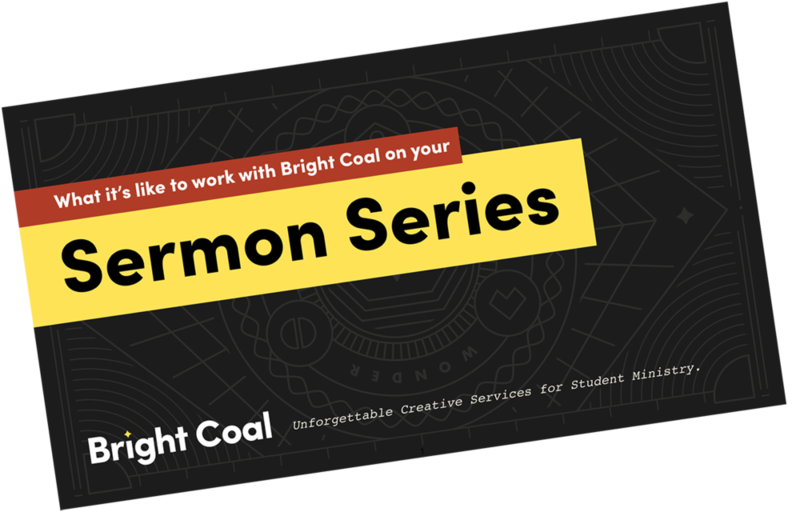 "I would recommend Bright Coal Creative to any church looking to step up their media game. Josh goes above & beyond for every project. He gets things done on time, stays current with all the trends so your looks are relevant & current, and puts a lot of thought into each project, so you have his absolute best work. Working with him has been a breeze!"